Nuts are a type of hard, dry fruit that do not split open when they ripen. Although there are a wide range of nuts, very few are actually botanical or “true” nuts. Examples of true nuts include acorns, chestnuts, and hazelnuts. However, the term “nuts” generally applies to the more loosely-defined selection known as culinary nuts. Culinary nuts encompass a multitude of seeds that fall under the umbrella term of “nuts” as well as botanical nuts. There are three types of culinary nuts. Drupe fruit seeds, Gymnosperm and Angiosperm seeds, and botanical nuts. Various types of edible seeds with hard shells fall into the culinary nut category. Many of these are seeds from so-called “stone fruits”, or drupe fruits. Drupe fruits are any type of fruit that consist of an external layer of flesh surrounding a single stone or pit. Although the external fleshy layer is typically soft, it may also be tough – an example is the coconut. The seeds of Gymnosperm and Angiosperm plants encompass the second category of culinary nuts. Gymnosperm translates from Greek as “naked seed”. Gymnosperm seeds do not have an external shell or fruit. They are left entirely exposed to the environment. Gymnosperm culinary nuts include ginkgo and pine nuts. Contrastingly, angiosperm seeds are enclosed within their fruit. The fruit of an angiosperm seed serves as the dispersal agent for the seed itself. Angiosperm culinary nuts include macadamia nuts and Brazil nuts. Peanuts and soy nuts are legumes that fall under the Angiosperm greater classification of plants. Finally, certain types of botanical nuts are considered culinary nuts. Hazelnuts and chestnuts are the most common edible botanical nuts. 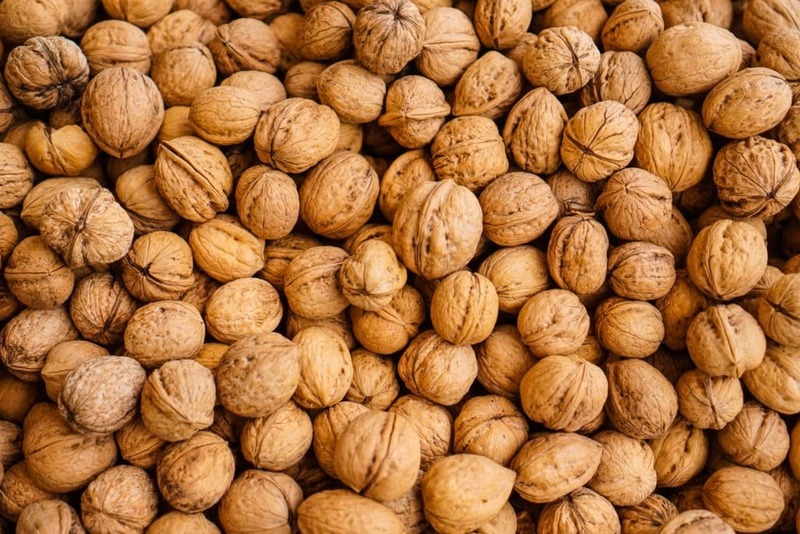 Most nuts are packed with nutrients, including healthy fats and protein. Nuts are available commercially in both processed and unprocessed forms. Nuts have been a part of our diets for centuries. Archaeological evidence revealed that nuts were being consumed as far back as 800,000 years ago. Nuts are rich in nutrients, vitamins and minerals. Nuts are touted as having a complete nutritional profile, due to the broad range of healthy compounds they contain. Without additional additives or ingredients, nuts are low in sodium. They contain carbohydrates which are found as naturally occurring sugars. Nuts contain monounsaturated fatty acids such as palmitoleic and oleic acid. Additionally, they contain essential omega-3 fatty acids. Nuts have a fairly high calorie content per portion. One serving size of nuts (28 grams) is worth between 150 and 200 calories. The size of the nut in question is important when it comes weighing out nutritional benefits. 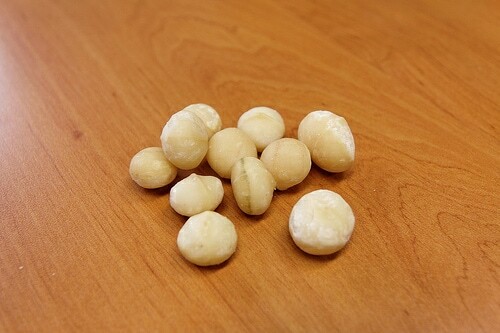 28 grams of macadamia nuts consists of approximately 11 nuts, worth 200 calories. Contrastingly, one serving size of almond nuts consists of 23 nuts. This serving size is worth 160 calories. There is little difference in the nutritional content of nuts that are raw or dry-roasted. Certain brands of commercial roasted nuts include salt, which can increase sodium content. Almonds are exceptionally high in protein and fiber. One 28 grams serving of almonds contains nearly 6 grams of protein and 3.4 grams of fiber. 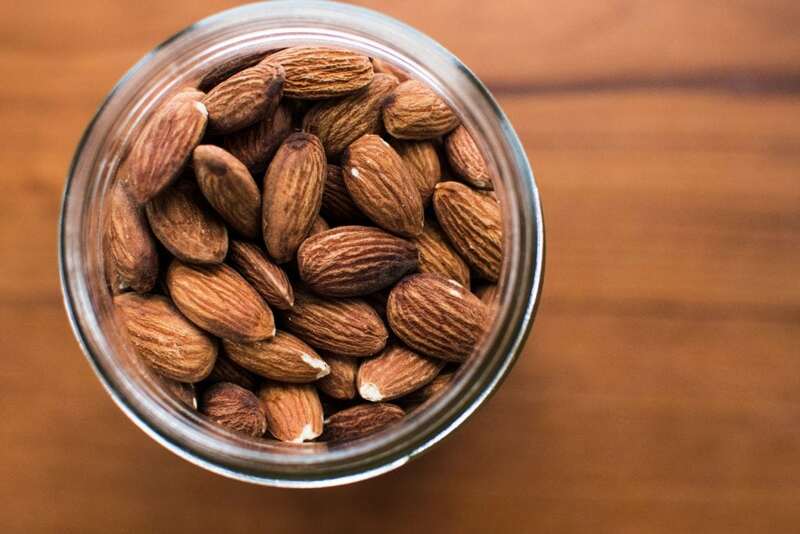 A study monitored the effects of daily almond consumption on health. Individuals who ate up to three servings of almonds a day benefited from lowered cholesterol and decreased belly fat. Brazil nuts have been established to have fast-acting positive effects on cholesterol. A single serving of Brazil nuts has the ability to reduce LDL (bad) cholesterol within nine hours. Simultaneously, this same serving can increase HDL (good) cholesterol. They are also high in the mineral selenium, which has potent antioxidant properties. Hazelnuts, walnuts and pecans are known as heart-healthy nuts. They contain antioxidants which reduce inflammation and cholesterol levels. Valencia peanuts are also considered heart-healthy. Regularly eating Valencia peanuts can lower triglyceride levels and help reduce risk of heart disease. Pistachios can contribute towards balancing blood sugar and cholesterol levels. 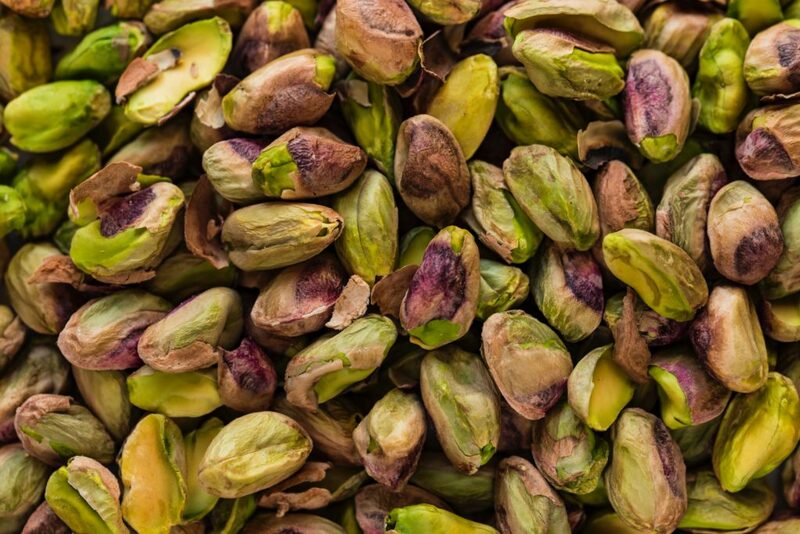 Consuming pistachios after a meal high in carbohydrates can help stabilize blood sugar levels. Pecans, macadamia nuts and hazelnuts contain high percentages of manganese, an essential mineral. A single serving of pecans contains 64 percent of your daily value of manganese. Cashew nuts are high in antioxidants and healthy fats. 80 percent of the fats in cashews are monounsaturated and polyunsaturated fats. To reap these health benefits, it is best to consume raw or roasted nuts. Nuts that have been pre-shelled tend to have a lower nutrient content. The Paleolithic diet is a diet that emphasizes eating all-natural, nutrient rich foods. On the Paleo diet, you will eat the same way our Paleolithic ancestors did. The Paleolithic era lasted from approximately 3 million years ago until 2,000 years ago. Human beings during the Paleolithic era were a society of hunter-gatherers. The agricultural revolution was yet to occur, and processed foods did not exist. This means that the Paleolithic diet consisted only of what could be hunted or gathered in nature. Our modern-day diets are high in processed foods and carbohydrates. The average diet today is nutrient deficient compared to how our predecessors ate. During the Paleolithic era, humans were athletic and lithe. 33 percent of the global population today is obese, a rate that continues to rise. The ketogenic diet aims change the way your body burns energy. The keto diet is also known as the low-carb, high-fat (LCHF) diet. The average diet is high in carbohydrates. When you eat carbohydrates, your body converts them into glucose. Glucose is the easiest compound for your body to burn as energy. When glucose is the body’s primary energy source, fat is stored instead of burned. The goal of the keto diet is to get your body into the metabolic state ketosis. When you are in ketosis, your liver breaks down fats and produces ketones. In order to attain ketosis, you will be severely restricting carbohydrates. At the same time, you will be eating plenty of healthy fats. The keto diet is 70 percent fats and 25 percent protein. Carbohydrates consist of 5 percent of your diet, or less than 15 grams a day. 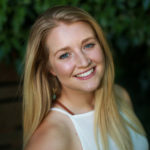 AIP stands for autoimmune protocol. The AIP diet is a comprehensive elimination diet that aims to improve gut health. The AIP diet is targeted at individuals with autoimmune disorders. Autoimmune disorders occur when the body self-attacks healthy tissue. There are no cures for autoimmune disorders, only treatments to manage the symptoms. The AIP diet aims to manage autoimmune disease symptoms through supporting gut health. The AIP diet consists of two phases. The first phase is the elimination portion of the diet, lasting 6 to 8 weeks. The second phase is the reintroduction phase, when eliminated foods may be reintroduced into your diet. Any and all foods that are considered irritants are to be avoided during the first phase of the diet. This process aims to soothe gut inflammation and heal intestinal mucosa. Ideally, a healthy uninflamed gut will support a state of low inflammation in the rest of the body. This reduces the incidence and severity of autoimmune disease symptom flare-ups. Nuts are prohibited during Phase I of the AIP diet. They may be re-introduced during Phase II. Nuts are versatile ingredients, and may be used to compliment sweet and savory dishes. Nuts also make a simple, delicious snack. When selecting nuts, it is preferable to choose raw nuts or unsalted roasted nuts. If you are purchasing commercial brand nuts, check the label for artificial ingredients and flavorings. Almonds are one of the most common nuts used in cooking. They can be used to create homemade almond milk or nut butter. Almonds can also be shredded on top of desserts such as ice cream. They can be used as an ingredient in cookies, cakes and other baked goods. The slightly bitter, hearty flavor of walnuts makes them an ideal ingredient in baked goods. An easy trick to sweeten walnuts is to toast them. 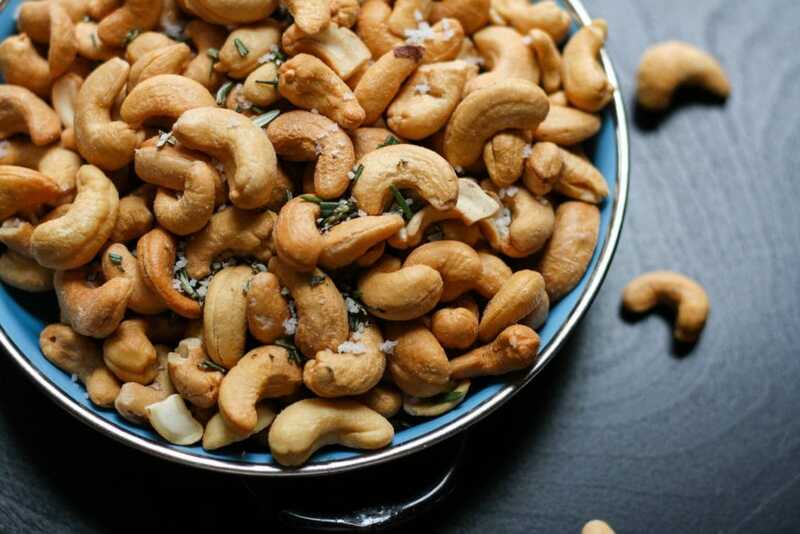 Cashew nuts are a staple ingredient in Thai cuisine. They are also a key ingredient in vegan recipes due to their flavorsome taste. Cashews can be used as an ingredient to create dairy-free spreads and dips. Pureed cashews can also substitute dairy in recipes for cream-based soups. Pecans are best known as the primary ingredient in pecan pie. Pecans can be used in other sweet and savory snacks, such as brownies and granola.